Ask RP Photonics for advice on what is the most appropriate technique of dispersion compensation in your case, and how to design the device. Dispersion compensation essentially means canceling the chromatic dispersion of some optical element(s). However, the term is often used in a more general sense of dispersion management, meaning the control the overall chromatic dispersion of some system. The goal can be, e.g., to avoid excessive temporal broadening of ultrashort pulses and/or the distortion of signals. Dispersion compensation is applied mainly in mode-locked lasers and in telecommunication systems, but also sometimes in optical fibers transporting light e.g. to or from some fiber-optic sensor. Dispersion compensation is an important issue for fiber-optic links, i.e., in the context of optical fiber communications. Here, strong dispersive broadening of modulated signals can occur in cases with high data rates. Without dispersion compensation, each symbol would be broadened so much that it would strongly overlap with a number of neighbored symbols. Even for moderate broadening, significant inter-symbol interference can strongly distort the detected signal. Therefore, it is essential to compensate the dispersion before detecting the signal. For high data rates such as 40 Gbit/s or 160 Gbit/s, pulse broadening becomes much stronger than for 10 Gbit/s, for example. This is essentially because the spectral bandwidth of the signal becomes larger. It is then generally not sufficient to compensate the second-order dispersion only; one also needs to deal with higher-order dispersion. Problems can arise, for example, when dispersion-shifted fibers with a substantial dispersion slope are used, and only dispersion of second order is compensated. 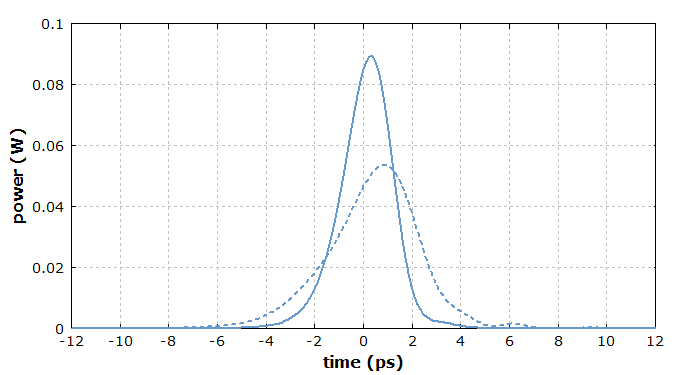 Figure 1 show this effect for a single 2-ps pulse at 1550 nm after 10 km and 50 km of such a fiber. Mainly uncompensated third-order dispersion is responsible for the resulting distortions. Figure 1: Distortion of a triple pulse after 10 km (solid curve) and 50 km (dashed curve) of a dispersion-shifted fiber, when only second-order dispersion is compensated. The simulation has been done with the software RP ProPulse. The resulting pulse distortion may appear small. However, a simulation with triple 2-ps pulses at a spacing as applied for 160 Gbit/s demonstrates that even in that case significant signal distortions can arise due to inter-symbol interference. 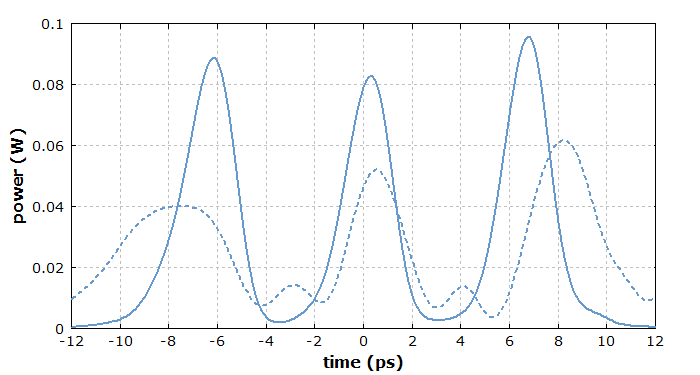 Figure 2: Pulse distortion after 10 km (solid curve) and 50 km (dashed curve) of a dispersion-shifted fiber, when only second-order dispersion is compensated. The dispersion of a transmission fiber can be compensated with sections of fibers with different designs or with other optical elements. Dispersion compensation modules (DCMs) can contain, e.g., long pieces of dispersion-shifted fibers or chirped fiber Bragg gratings. The latter have the advantage of compactness and comparatively low insertion losses. To some extent, the effects of dispersion in a system for optical data transmission can also be mitigated by electronic dispersion compensation. In a mode-locked laser for femtosecond pulse generation, the chromatic dispersion introduced by the gain medium and other optical components in the laser resonator is often not desirable, because it tends to broaden and chirp the generated pulses. While the naturally occurring chromatic dispersion is often in the normal dispersion regime, the desired dispersion may either be close to zero or even anomalous (for the formation of quasi-soliton pulses in the resonator). Such dispersion values can be achieved by introducing optical components with anomalous dispersion. In the case of bulk lasers, such components are usually either special dielectric dispersive mirrors (e.g. in the form of monolithic Gires–Tournois interferometers or chirped mirrors), or prism pairs. For mode-locked fiber lasers, the dispersion can be compensated with special dispersive fibers (e.g. photonic crystal fibers or multimode fibers where a higher-order mode is used), with chirped fiber Bragg gratings, or sometimes with bulk components such as pairs of diffraction gratings. For pulses with durations below roughly 30 fs, it is necessary to control not only the second-order dispersion but also the dispersion of higher orders. It may then be important e.g. to select the appropriate material for a prism pair, or an optimized geometry of a prism compressor. There are also special devices called GRISMs , with a grating structure on a prism, which make possible an optimized ratio of the strength of second- and third-order dispersion. Dispersive optical elements can also be used to dispersively (linearly) compress ultrashort pulses outside laser resonators. The article on pulse compression gives more details. 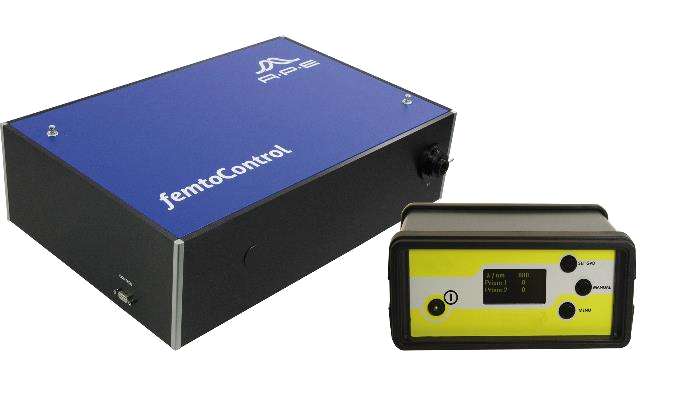 The APE femtoControl is a compact motorized dispersion compensation unit for optimization of the duration of femtosecond laser pulses in the spectral range of Ti:sapphire lasers. For example, femtoControl can help to achieve more crisp and clearer microscope images especially for multi-photon microscopy. Static and tunable dispersion compensation modules for 10 and 100 Gb/s communication systems. Low loss chromatic dispersion emulator available for lab use.